Birds are the one animal that seem to make it into every season of decor, but Christmas is the time that birds really get to sparkle. 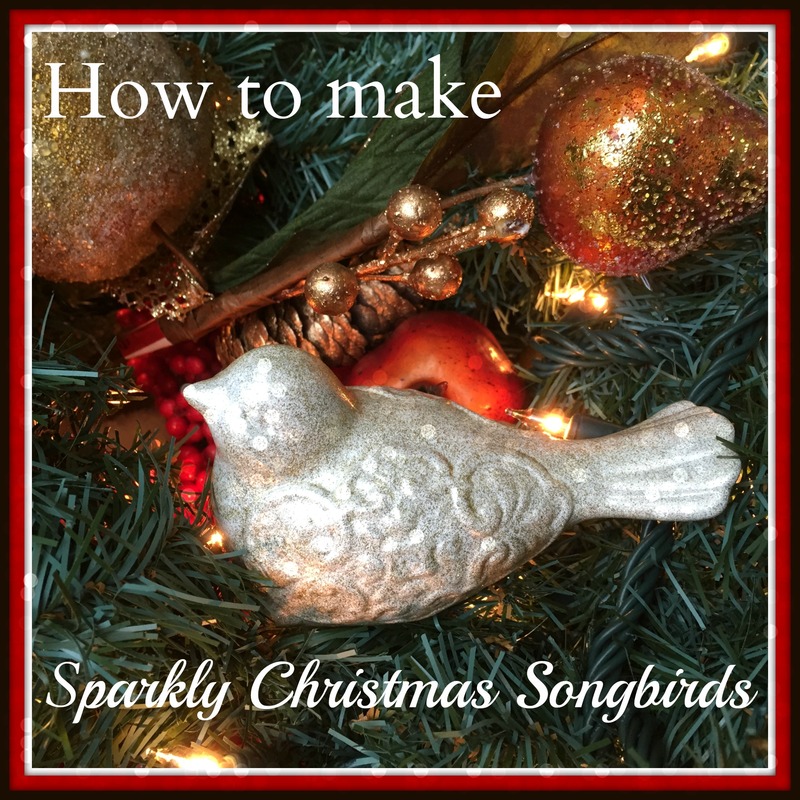 No, literally, at Christmas you have free reign to festoon your home with glittery Christmas songbirds. I say “Go for it!”, but instead of spending top dollar for sparkly ceramic birds, make your own. It’s easy, fun, and frugal enough that you might have some cash left for a gift for yourself. Some inexpensive ceramic birds. The colour does not matter, you just need to like the shape. I got mine super cheap at Michaels when the summer stock was being switched over to fall, but I’m sure there are sales going on again as the fall stock is moved out to make room for Christmas. You could also try the dollar stores or even Value Village. White, glossy spray paint, or whatever colour you want as the base colour of your bird. Red, gold, blue, or any metallic would be pretty. Gold glitter spray paint. There are actually many colours of glitter spray paint, not only gold and silver. Go with whatever makes you happy. Time, not a whole lot, but a few hours. It only takes about 10-15 minutes for a coat of spray paint to dry enough that you can apply another coat and 1 hour for it to be dry enough to touch. Before we get to the “How To” portion of this post, let me share a few tips about spray painting that I learned while doing this project. Wear rubber gloves. My fingertips are currently sticky with drying spray paint and it’s driving me crazy. I can’t get it off even though I’ve tried using soap with pumice, vegetable oil, regular soap, scraping, etc. It’s not good, trust me. Go outside to spray paint if you can because it is stinky and flammable, two thing that do not go with anyone’s decor. Pick a day to paint that is not windy, or if you have to spray paint outside on a windy day, find some shelter so you don’t get a face full of glitter that does not come off. Wear clothes and shoes that you don’t care about. I am currently wearing a crappy navy blue hoody that has actually been improved by the misting of glitter paint it received when the wind turned, but I’m choosing not to even acknowledge the gold glitter on my black boots. Start spraying off the thing you are painting, then steadily swipe across until you are past it. In other words, try not to hold the paint can in one spot as it will make drips. Which brings me to: do not fret about the occasional drip. Yes, you want to try to minimize them, but perfection is overrated and anyone judging your bird because of a paint drip should be on the naughty list. The “How To” portion of this post is rather thin because it is just so easy. First you spray paint your birds in the glossy base coat. Two coats should be enough for full coverage. Once dry, apply the coat of glitter paint. That’s it really, all that is left is letting your paint dry and finding the perfect location to show off your festive creation. If all that crafting leaves you a little peckish, you might want to stop for some fudge and a Harvest Moon cocktail. That combination is sure to perk you up and get your creative juices flowing again. It might seem a little decadent, but tis the season after all. This is awesome! What a fun DIY! I have to go hunting for little ceramic birds, now! I’ve never heard of using a garment bag as a spray paint shield. Genius!